Does the Walk Top Treadmill Desk Really Work? In the past we have talked a lot about exercise equipment because getting fit is such a hot topic. To keep you up to date as to what is new and innovative on the market regarding this topic we thought you might like to hear about the Walk Top Treadmill Desk which allows you to work at the same time you are getting fit. We have all heard of multi- tasking and most of us have even tried to get a couple things done at the same time on occasion only to find that we are either really, really good at multi- tasking or we fail miserably and realize that we need our undivided attention to get anything really important done. The Walk Top Treadmill Desk is a perfect example of multi- tasking at its most ambitious. The claim is that by attaching the Walk Top Treadmill Desk to your treadmill you can get work done while simultaneously burning calories on the exercise machine. The hype is mostly realized by the fact that we are so over worked as a society and our priorities seem to be go, go, go at any cost that we need to combine our exercise with our work so that we never fall behind the curve or let the competition get even close to where we are. The cost of the Walk Top Treadmill Desk is $499.70 at your local Staples or at Staples.ca. The cost of this one is relatively cheap compared to some models and expensive compared to others. Do your homework and you will most likely find one in your price range if this one is too expensive for your budget. The commitment required for the Walk Top Treadmill Desk may seem high but it really is not. The quick release on this unit makes putting it on and taking it off pretty simple indeed. The only commitment required is for the purchaser who must be committed to both burning calories and burning the midnight oil for the good of the company. We sort of make light of the commitment required to do your exercise and work at the same time but in reality, the Walk Top Treadmill Desk does have some advantages to it for sure. If you simply want to watch a documentary or YouTube videos while you exercise and that ability will cause you to actually use the treadmill more often or for longer periods than it may well be worth the money. Nobody says that you have to do actual work on the desk do they? But if you DO have some important work that absolutely needs to get done and you can burn some calories while you do it then why not? 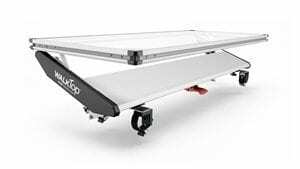 The Walk top is a solid unit that attaches quite easily to most treadmill models and provides a firm work space when installed. It is lightweight yet durable and looks pretty good when in place. Overall we cannot really knock the Walk Top Treadmill Desk . It truly does what it says it will do which is provide a steady and sturdy work station while connected to your favorite treadmill. While we hope that people take time out from work to do other things when you simply have to multi-task this lets you do it comfortably and efficiently. What do you think? Does the Walk Top Treadmill Desk work or not?